The little man turned 4 last week and I threw him a rocket ship birthday party with the help from family over the weekend. Everyone had a ton of fun. I like to pick themes for birthday parties. It helps narrow down the possibilities. His 3rd birthday was all about bugs and his 2nd was about balls (click on each to see a few details). So far it’s been a breeze choosing a theme as Seth’s preferences have been very obvious. 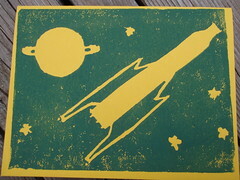 Here’s a rundown on our rocket ship party. Decorations – The piece de resistance was a rocket ship tent purchase on clearance after Christmas that was given to Seth for his birthday. I wanted to paint Styrofoam balls to look like planets and hang them with paper stars in the gazebo but ran out of time. 1. 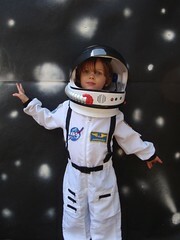 Astronaut portraits – We gave Seth an astronaut costume for his birthday. If this didn’t have the triple purpose of present, party prop and Halloween costume I wouldn’t have spend the money. (Yes, I realize I’m tempting fate by buying a Halloween costume this early in the year.) Each kid got to try on the suit and helmet. We had them pose in front of a backdrop made from left over tar paper stapled to the wood fence and spray painted with a star scape. I’ve cropped out their feet for a more “realistic” look and am including a print or two with each corresponding thank you note. The kids were so cute patiently waiting their turn. They each wanted a shot with the helmet closed as well as open. Many wanted multiple turns. 2. The second space themed activity was a scavenger hunt. I compiled 6 stock photos from those available from Microsoft. 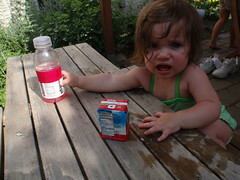 I hid a pile of these pictures in 6 locations in the neighbors yard. Each type of picture in a different location. After showing the kids what they were looking for and giving them directions I let them loose. 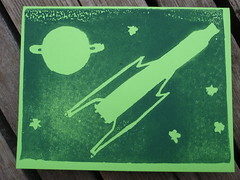 The object being to collect all 6 pictures and return to me for a surprise reward (rocket ship stickers). I’m mean – I also made them count each one our for me as proof. If they didn’t have all 6 I would have them lay the pictures out on an uncut original sheet to see what was missing. Thank you gifts – I adore thank you gifts. They’re inexpensive and fun. Sticking with our theme we included “sand from the moon” and some rocket balloons. To keep the cost down we split out packages of rocket balloons and wrapped in tissue 4 balloons and 1 or 2 blowing straws per child. 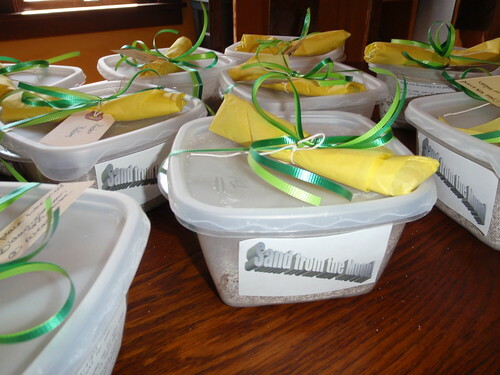 Then we mixed up a bucket of homemade moon sand based off this tutorial – basically 2 parts play sand, 1 part cornstarch and enough water to create the right moldable consistency. Don’t expect it to be like the commercially processed moon sand but this is just as fun and a heck of a lot cheaper. A big thank you to my parents and hubby for all heir help putting this together. Sometimes my ideas are bigger than the possibilities and it’s good to have a support troop to ground me. Ryder has that same rocket ship! He got it for his birhday also, from an aunt that scored in the after Christmas sale also! Love the phot backdrop idea! It looks so realistic! Wow what a party. Are you sure you aren’t really an event planner?? Lucky kids. Giving me lots of ideas here. But hats off for such a fab party. Could not do it myself…..
love it, I wil have to try the moon sand stuff, and the photo shoot – genius! That’s way awesome. Love the invites and the photo backdrop. Wow! Great job!! That’s one of the coolest party favors I’ve EVER seen! I found those little rocket balloons that you linked to at Target around Christmas time for $1 or $2 in the dollar bins near the front door, for a bag of like 25 or 50 with a small pump. It worked very well. I’m going to check there first b/c online they seem really pricey don’t they? But just wanted to say you have some great ideas! Thanks for sharing them. You are AMAZING! 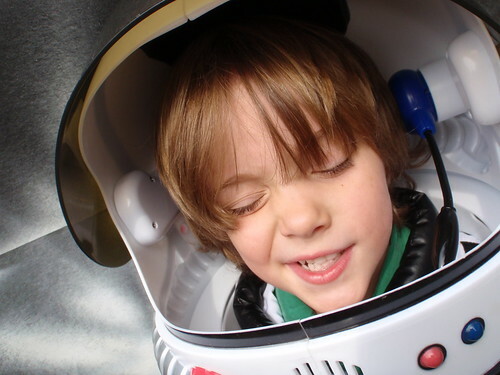 I found your photos while researching ways to throw my four (soon to be five) year old son, Alrick, his own Rocket Party. I found much inspiration from your posts. You live your life very well – true to your spirit. I simply had to tell you that! Blessings! Finally a party that lives up to my expectations, I have been searching the interent for days trying to find another parent with amazing creativity! I’m having trouble with the wording of the party……….writiers block, can you help? just need to get the word out in a cool way any hlelp would be appreciated. I love theme parties too – you did a wonderful job! 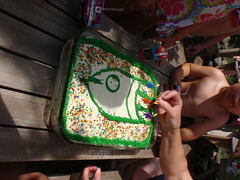 I didn’t end up doing the full rocket party this year, just the cake. But if I had, I would definitely have been stealing some of your ideas! I LOVE your bday party idea. This is exactly what my son wants for his 4th. Quick question…where do you get the blowing straws for the rocket balloons? 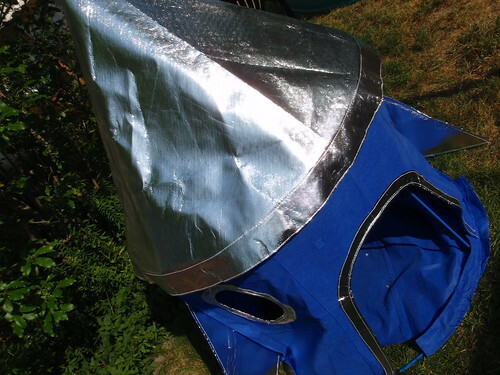 I saw your blog when planning my son’s outer space party. 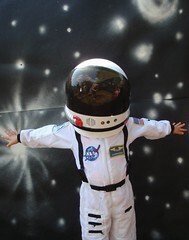 I used your astronaut suit idea and painted a black sheet with white spray paint and had the kids pose in front of it. It was a huge hit. 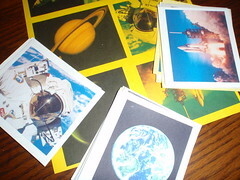 I also used your link to the outer space pictures and did the same scavenger hunt. Thanks for your creative ideas and more importantly for sharing them, it was very helpful.